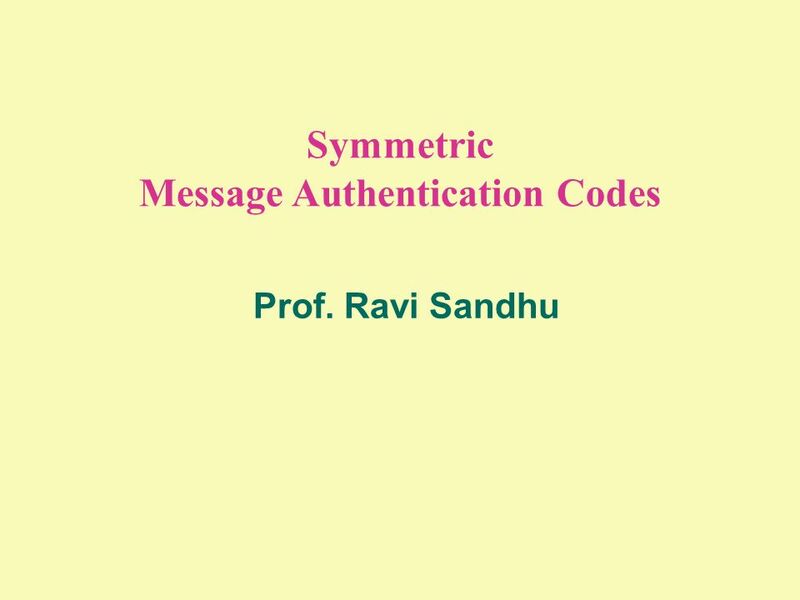 Symmetric Message Authentication Codes Prof. Ravi Sandhu. 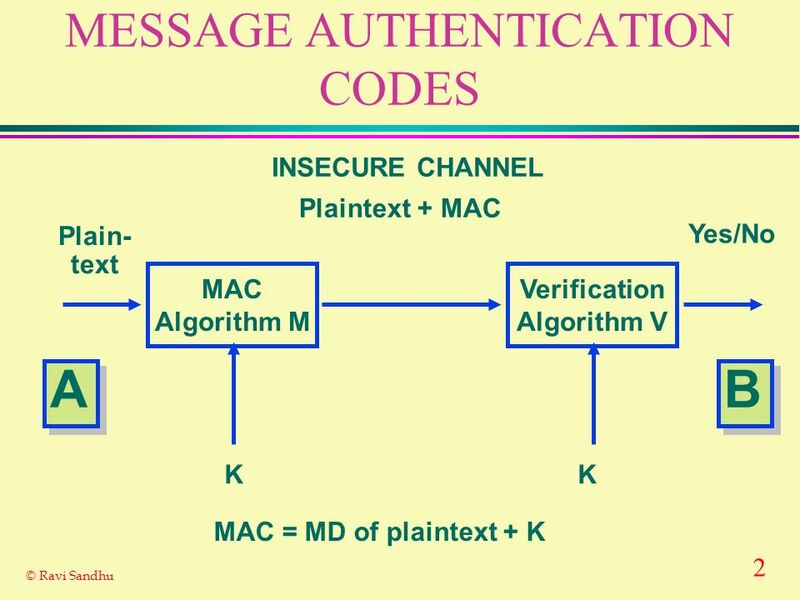 Download ppt "Symmetric Message Authentication Codes Prof. Ravi Sandhu." ISA 662 SSL Prof. Ravi Sandhu. 2 © Ravi Sandhu SECURE SOCKETS LAYER (SSL) layered on top of TCP SSL versions 1.0, 2.0, 3.0, 3.1 Netscape protocol later. Symmetric Encryption Prof. Ravi Sandhu. Asymmetric Digital Signatures And Key Exchange Prof. Ravi Sandhu. Asymmetric Encryption Prof. Ravi Sandhu. 2 © Ravi Sandhu PUBLIC KEY ENCRYPTION Encryption Algorithm E Decryption Algorithm D Plain- text Plain- text Ciphertext. PKI Introduction Ravi Sandhu 2 © Ravi Sandhu 2002 CRYPTOGRAPHIC TECHNOLOGY PROS AND CONS SECRET KEY SYMMETRIC KEY Faster Not scalable No digital signatures. Lecture 7 Overview. Advanced Encryption Standard 10, 12, 14 rounds for 128, 192, 256 bit keys – Regular Rounds (9, 11, 13) – Final Round is different. MAC Raushan. DES simple fiestel network 3131 PlainText Blocks 2*4=8bits 31 f f =0011 xor 0011=0000 = 0 f(r,k)=(2*r+k^2)%8 f(1,5)=(2*1+5^2)%8=3 xor 3 3. An Introduction to Secure Sockets Layer (SSL). 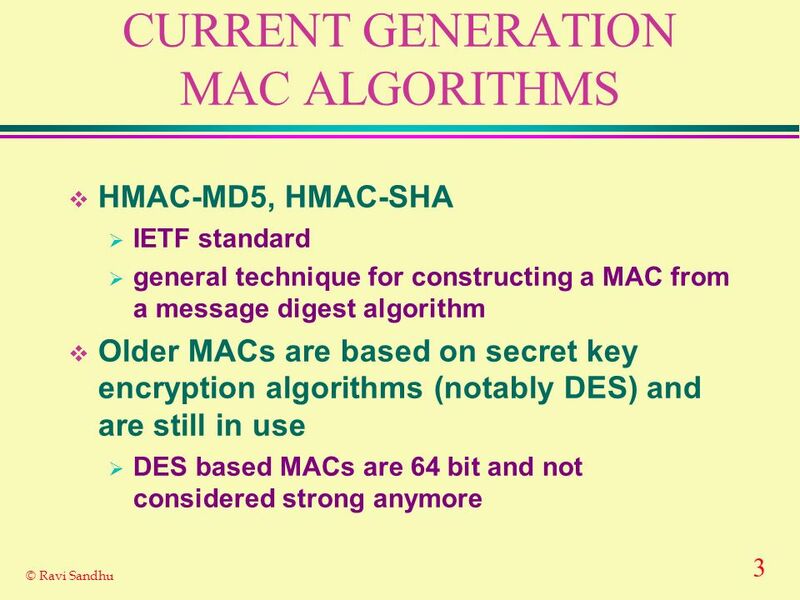 Overview Types of encryption SSL History Design Goals Protocol Problems Competing Technologies. Transport Layer Security (TLS) Protocol Introduction to networks and communications(CS555) Prof : Dr Kurt maly Student:Abhinav y.
SSL Prof. Ravi Sandhu. 2 © Ravi Sandhu CONTEXT  Mid to late 90’s  SSL 1.0 never released  SSL 2.0 flawed  SSL 3.0 complete redesign  TLS from Netscape. 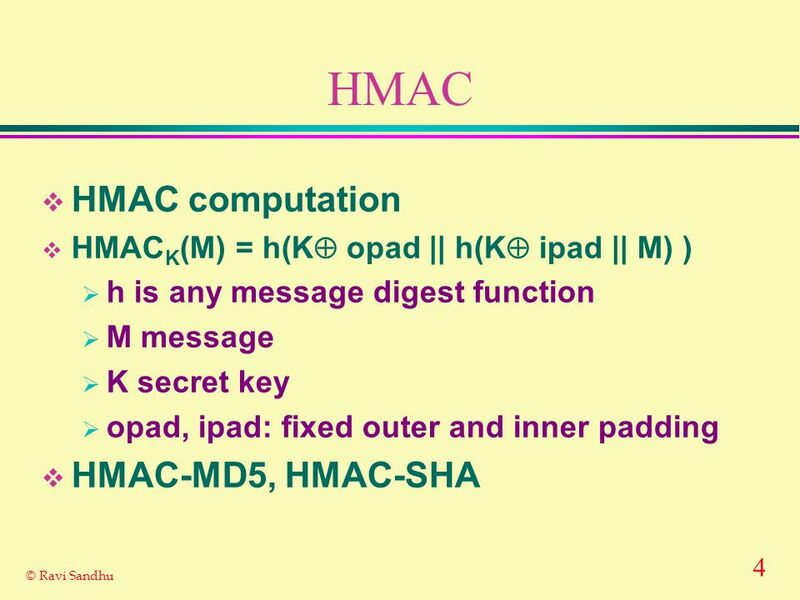 Session 5 Hash functions and digital signatures. Contents Hash functions – Definition – Requirements – Construction – Security – Applications 2/44. BY MUKTADIUR RAHMAN MAY 06, 2010 INTERODUCTION TO CRYPTOGRAPHY.